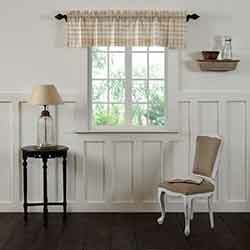 Dozens of country valances in patchwork, checked, plaid, floral, burlap, and striped designs, by VHC Brands, Park Designs, and Raghu. 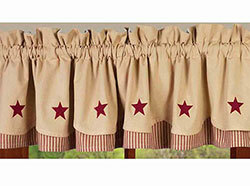 Perfect window treatments for your beach, cabin, country, primitive, cottage, or shabby chic home! 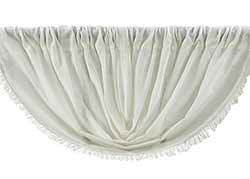 72 inch and 90 inch curtains. 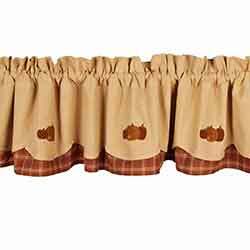 Features felt applique pumpkins against a tea dyed cotton fabrid with scalloped edge, layered over a plaid of pumpkin orange, cream, and green. 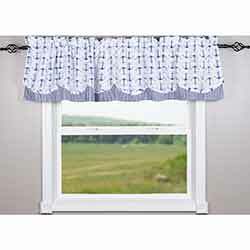 This country style valance features layers of cotton fabric - gently scalloped oat and black windowpane check over top solid black with staright edge. 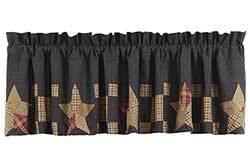 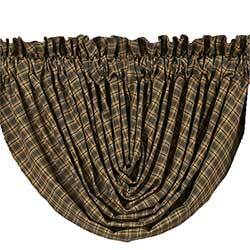 This country style valance features an oat and black windowpane check fabric, with two drawstrings for creating the gathered scallops. This country style valance features an oat and black windowpane check fabric, a neutral look for any room. 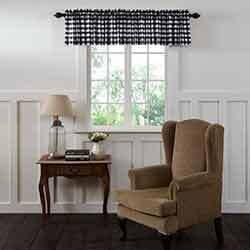 Let in the sun in with the Annie Buffalo Check Black Valance, in the 60 inch length. 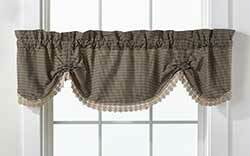 Let in the sun in with the Annie Buffalo Check Black Valance, in the 72 inch length. 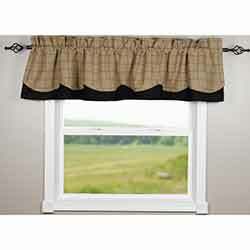 Let in the sun in with the Annie Buffalo Check Black Valance, in the 90 inch length. 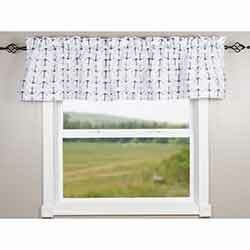 Let in the sun in with the Annie Buffalo Check Grey Valance, in the 60 inch length. 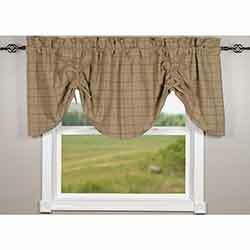 Let in the sun in with the Annie Buffalo Check Grey Valance, in the 72 inch length. 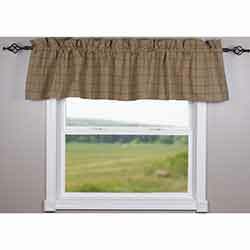 Let in the sun in with the Annie Buffalo Check Grey Valance, in the 90 inch length. 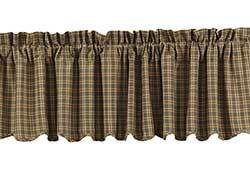 A warm look for your country home, this checked valance features a color palette of burgundy, tan, sage green, and brown. 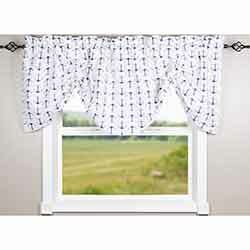 The Apple Valley Collection features soft apple green and off-white mini gingham check fabric, accented with embroidered red apples. 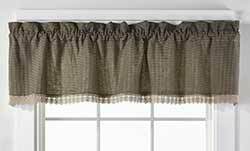 With it's tan and creme stripes, the Au Natural valance is a versatile neutral that coordinates with many home decor looks! 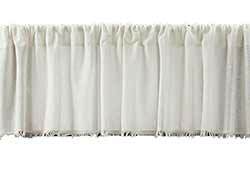 Features a solid colored layer over a ticking striped layer, with a draw string on the solid part for you to gather into you preferred scallop. The Au Natural Collection features a lovely neutral palette of jute-colored tan and creme, in a mixture of solid and ticking striped fabrics. 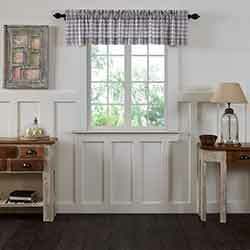 A border of crochet cotton lace adds a sweet touch to the classic black gingham check body of this sweet scalloped valance. 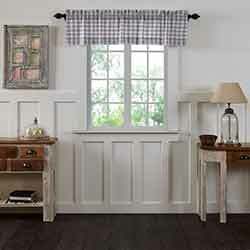 A border of crochet cotton lace adds a sweet touch to the classic black gingham check body of this sweet country valance. 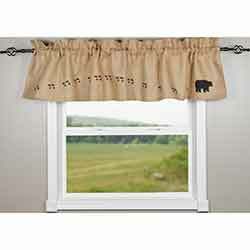 Great for a cabin or lodge home decor, this cotton burlap valance features a black bear and a trail of paw prints!